My baby turned one on Friday. She has four teeth and hair long enough for two tiny pigtails. She has at least five words that we can tell – Mama, Baba (abba – “daddy” in Hebrew,) “Zeh” (Hebrew for “that”,) “Den” (Ken – Hebrew for yes,) and our nanny’s name. 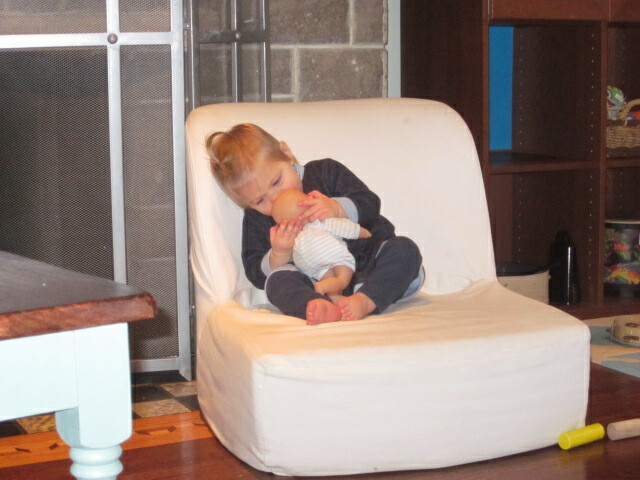 She has recently become attached to one of our baby dolls and can spend upwards of twenty minutes sitting in a chair, cuddling her baby. 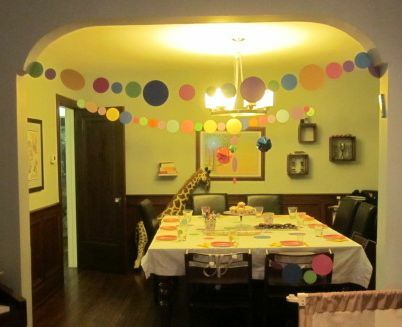 The garlands were a lot of fun to make: Cardstock circles (I used my 3 1/2 inch circle punch and some 5-inch precut circles) sewn into a chain. They’re fast, too. I tried to keep the food thematic. 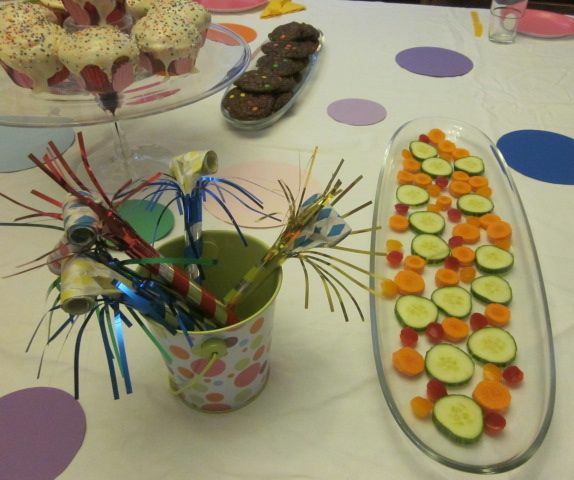 We had brownie cookies with “polka dots” (m&m’s,) cupcakes in polka-dot wrappers with round sprinkles on top, and veggies cut into rounds. There was also pizza and bourekas. Yum. Sure, the icing is a bit sloppy, but nobody complained. 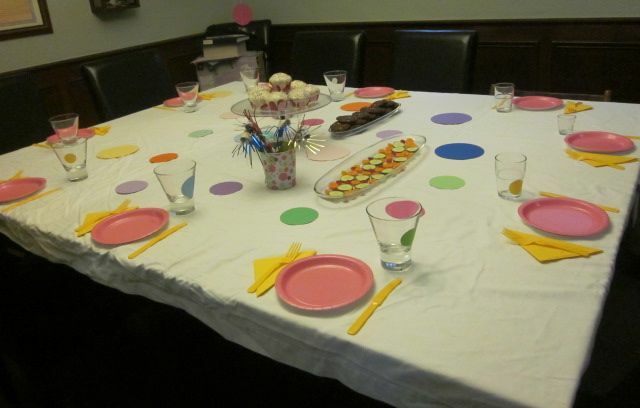 And aren’t the polka dots all over the table cool? 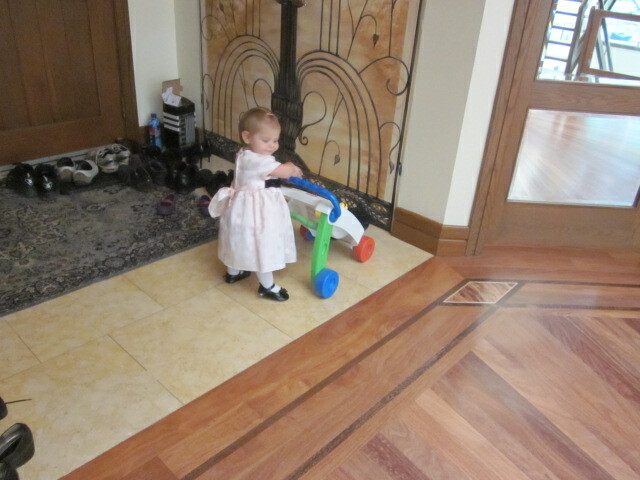 Even R’s outfit – a polka-dot dress – fit in with the theme. 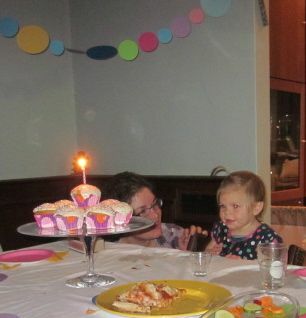 And as you can see, she was mesmerized by the candle on her cupcake… and very pleased when we finally gave her one to eat. 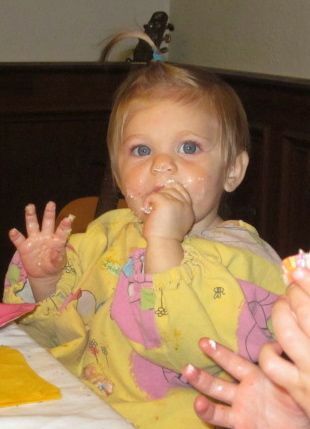 It was only a couple of minutes before all that remained of her cupcake was a (very large) smear of icing on her face. After dinner and dessert I pulled out the guitar and sang her favourite songs. Then I changed gears and got everybody singing the Shehecheyanu, the Jewish prayer thanking God for sustaining us and keeping us alive to reach this milestone. Mr. December and I got a bit misty-eyed, especially during the next song – Al Kol Eleh – which is all about being thankful for all of life, both the bitter and the sweet. The bitter was so very bitter… but the sweet is indescribably sweet. So that’s it… we survived her first year. Sure, we were in “survival mode” more often than not, and we’ve been awfully exhausted, but we made it. 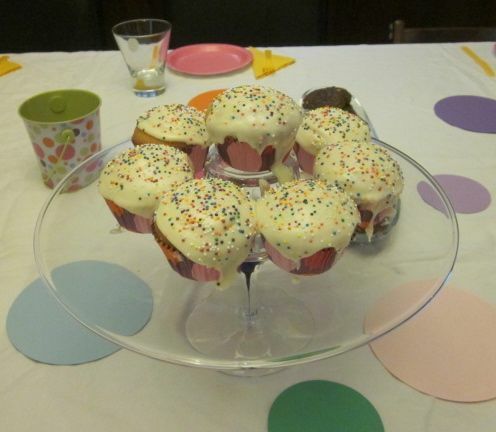 And – as my best friend pointed out – I made it to her first birthday without getting knocked up (I was six months pregnant at N’s first birthday.) And that, as Martha Stewart would say, is a Good Thing. Happy Birthday, little R. It’s been a real trip. For those of you not keeping track of the Jewish calendar, we’re now halfway through the festival of Sukkot, the next-to-last in our month-long marathon of holidays (trust me, the Christmas season has nothing on the Jewish holiday season. We’ve pretty much got at least two festive meals a week for four weeks.) I love Sukkot. 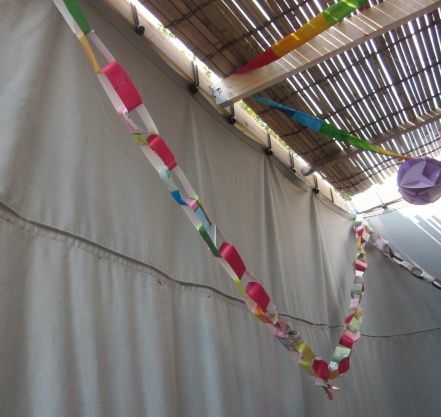 Building and decorating the sukkah takes care of any residual Christmas-decorating envy I may have, and it’s a mitzvah to invite guests into the sukkah, which I love to do. We built our first sukkah several years ago, on the driveway. It was lovely (if poorly lit) until the wind started up one night. 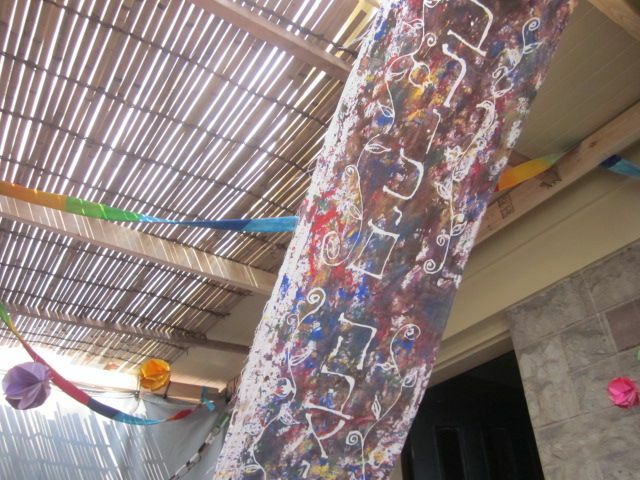 The canvas walls acted like an enormous sail, and the next morning we found our entire sukkah lying on its side on our next-door neighbour’s lawn. 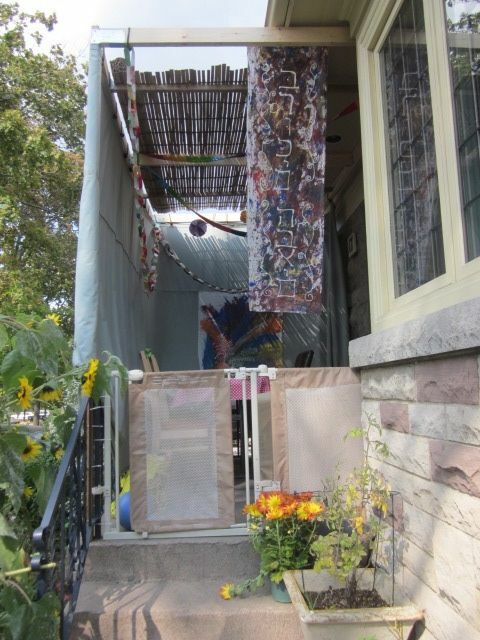 The next year we tried the backyard, which meant that bringing food and drinks to the sukkah involved walking through the back hallway and through the third bedroom, then down the porch steps, sometimes in the dark. Also, there was no urgency involved in taking it down; I joke that we’re the Jewish equivalent of people who haven’t taken down their Christmas tree by June, because last year’s sukkah was still up as of this past May. Anyhow, after last year’s debacle in which I pressured Mr. December to set up the sukkah, which we then failed to use (it wasn’t my fault! I gave birth on Erev Sukkot!) he declared that I was on my own. I recruited a friend’s husband to help me build (bartered, actually, for some groceries and a place to bury their placenta – true story.) And build we did! I even used a circular saw to cut the lumber. And the reason I had to cut the lumber? This year we have a new location, the best yet! This year our sukkah is on the front porch. 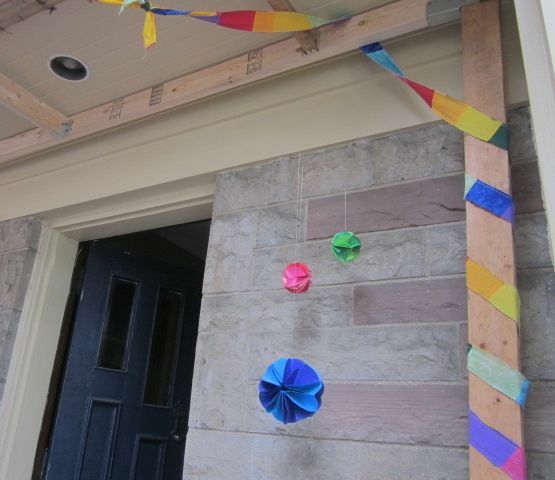 It’s a mitzvah to decorate the sukkah. Some people use strings of lights and tinsel (especially in Israel, where they don’t really associate that stuff with Xmas,) others decorate with fruits, vegetables, and other harvest-themed decor, and still others hang posters of Israel, of great Rabbis, and of quotes from the Torah. 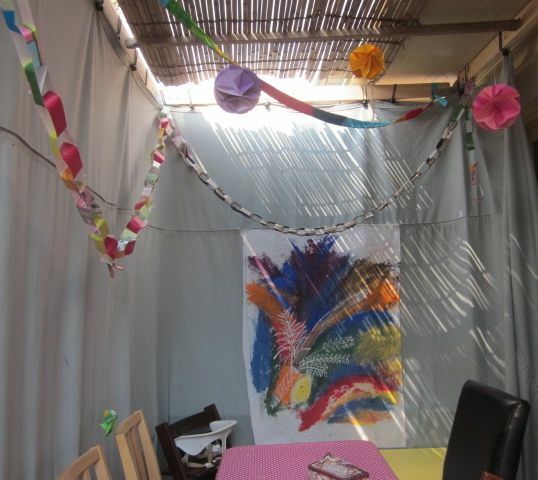 I’ve decided that since Sukkot is also called “the season of our happiness” we should decorate the sukkah as we would for a big, joyful party. All of our decorations are handmade by us, and they dance beautifully when the wind blows through. You might recognize my reusable fabric streamers from last Purim. A paper chain is an easy craft even for a preschooler. 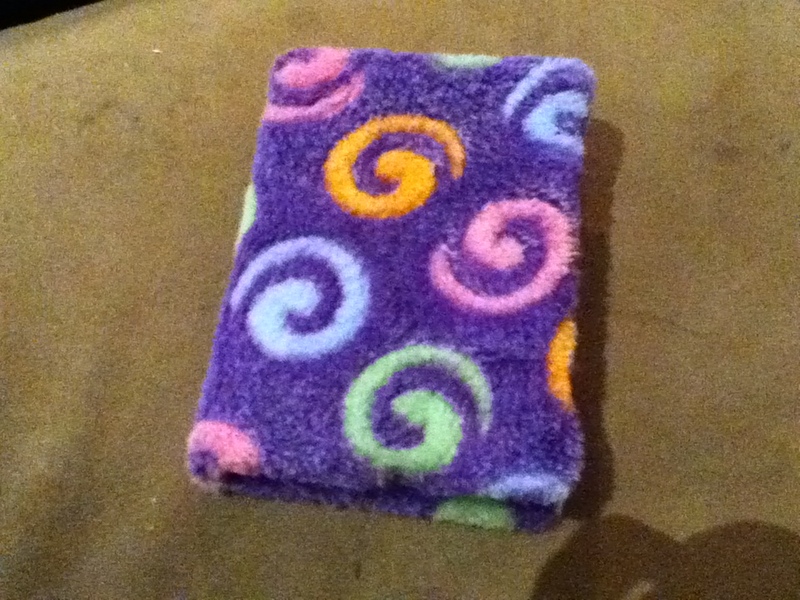 For this one I cut strips from gift bags that were too shabby to be re-gifted. I handed them over to K along with a roll of tape and she spend the next hour engrossed in making the chain. 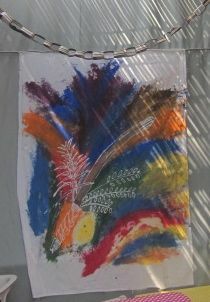 This banner, and the “welcome” banner, were made using a batik technique involving blue school glue and craft paint. This one depicts a lulav and etrog, or as Wikipedia calls them, the Four Species. We even have a light in our sukkah. The front porch light is plenty bright in the evenings, and it doesn’t require us to run extension cords at all. 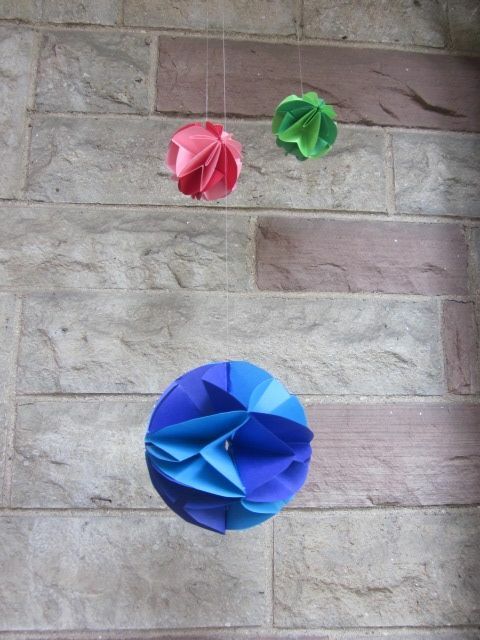 Oh, and those paper balls are from a tutorial by Creative Jewish Mom. Aren’t they cool? 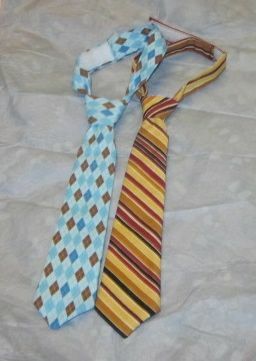 I love them so much that I might just bring them inside and hang them in the playroom when Sukkot is over. So that’s our sukkah. 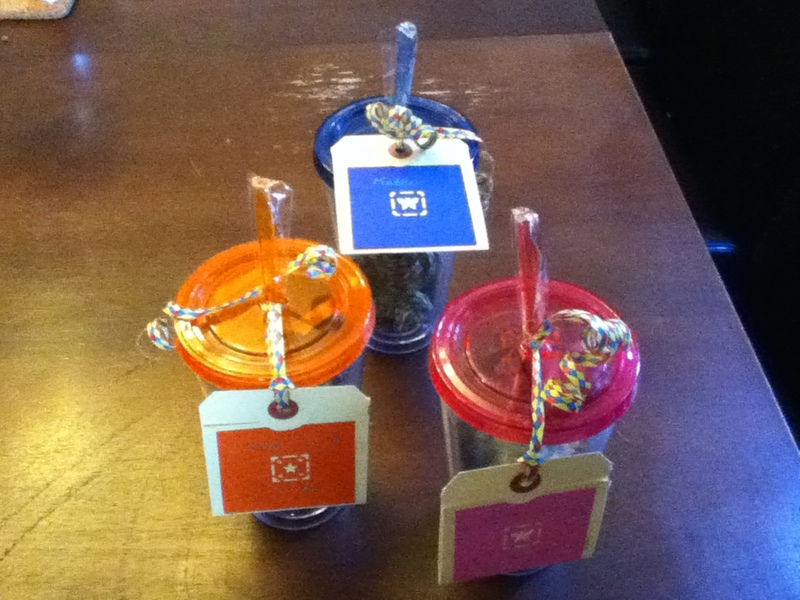 Thanks for visiting, and Chag Sukkot Sameach – Happy Sukkot! Six years ago tonight, I stood in the synagogue and prayed more fervently than I ever had. I cried, I pleaded, I rocked back and forth on the balls of my feet. I begged God for the clarity to understand why I was denied the chance to mother my child, for the grace to recover quickly from my miscarriage, and for the good fortune to get pregnant again and have a chance to be a mother. Five years ago tonight, I wasn’t especially hungry. I was pregnant and sick with a cold, and wasn’t planning to fast. 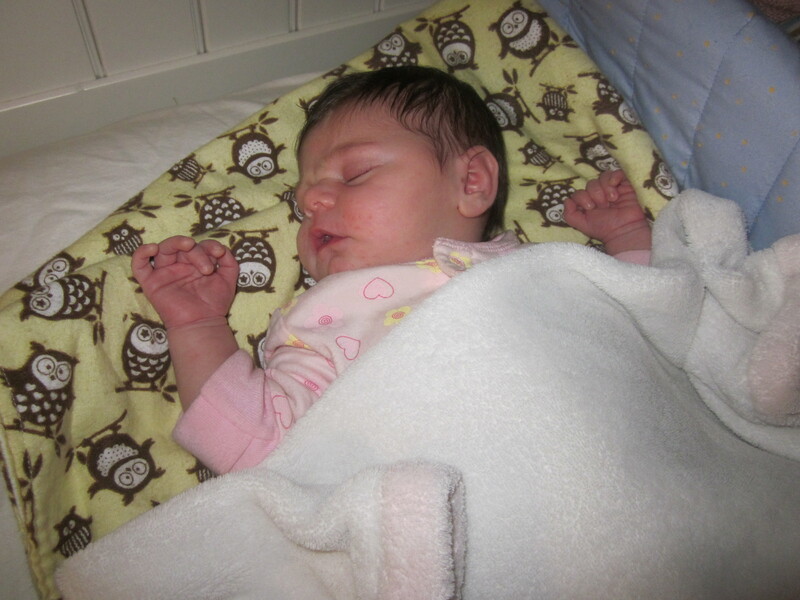 I prayed, if not as feverishly as the previous year, for a safe birth and a healthy baby. Four years ago tonight I took K into services with me and hugged her close while I sang the Yom Kippur liturgy. I was thankful, so thankful, that I finally was a mother. The shehecheyanu – the prayer of thanks for being able to reach this day – never felt more apt. Three years ago tonight I was feeling testy from the fertility drugs and hormones flooding my body. 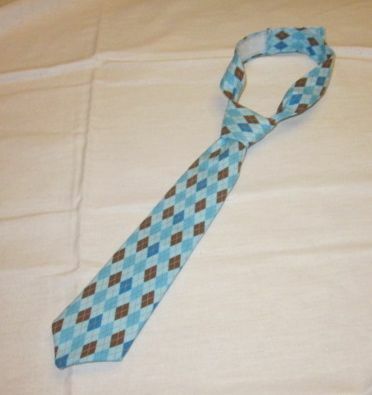 I had just received a jubilant email from an aquaintance announcing her second pregnancy. Why was it so easy for her, and so hard for me? We were nearing the end of our options: we’d finally made the jump to in-vitro fertilization. I was terrified that if it didn’t work, I’d have a hard time being with our friends who had more than one child. I davenned, prayed, that God would give me the strength of character to accept the outcome of our treatments with patience and peace. Two years ago tonight I snuggled our tiny baby boy in a Moby wrap and tried to daven, though my attention was mostly on K’s behaviour and N’s feeding cues. One year ago tonight I was heavily pregnant – overdue, in fact – and didn’t fast for fear that I’d end up going into labour too hungry and depleted to be able to push. I prayed for my labour to start soon. To everyone observing Yom Kippur, Gmar Chatima Tova (may you be inscribed in the book of life) and have an easy fast.